Look around you and you will soon be aware that everywhere you look, you see textiles. Clothing and home textiles are obvious to all, but in fact, textiles are used in very many other applications today: like in aircrafts, construction, medical, the list is long. So, if you chose a carrier in the textile machinery industry, you chose a stable industry with constant demand. The textile machinery industry has nothing to do with the sewing machine your grandmother used to have. It is a high-tech industry that utilizes digitalization and automatization to develop efficient, high-quality, sustainable solutions. A carrier in the textile machinery industry means you have the world as your playground. Your customers are located in countries that extend from Europe throughout Asia the Middle East and Americas. But be prepared! Travel in the machinery industry means going off the beaten track to exciting and exotic destinations. The demand for competences ranging from engineering, sales, electricity, to mechanics, programming and R&D is high. At the same time, many companies are facing a generation shift, so if you are nurturing ambitions in these areas, then what are you waiting for? Want to know more? 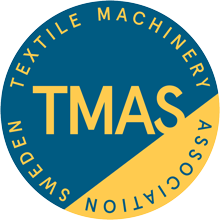 Contact us at tmas@tebab.com and we can tell you more. We can even connect you with our member companies. We also conduct seminars in schools, drive internships and arrange company visits for schools.